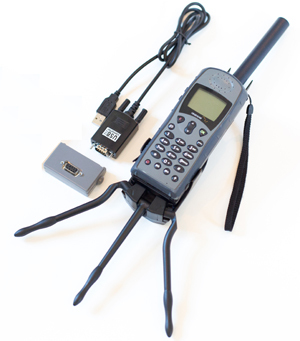 The 9505A USB Connection Kit provides the hardware required for using Iridium 9505A handsets with the Redport Optimizer or the AxcessPoint. Data Adapter: attaches to the Iridium 9505a phone and provides a connection for the data cable. Allows simultaneous connection of the AC Travel Charger, Auto Accessory Adapter or Solar Charger. USB-to-Serial Cable: connects the Data Adapter to the USB port of the Redport Optimizer or AxcessPoint.